Meet the Plumwood Posse, my dogs who bring inspiration, delight, laughter, friendship, lessons and knowledge to each and every day! Shown L to R in the photo below are: Chibi-chan RN, Penelope, GingerPeach CRO-I CGC retired Therapy Dog, Geronimo CRO-I CGC, Rocky CD RA and Piglet P-CRO-III. I coined the name “Plumwood Posse” over a decade ago, the group shown below is version 7.0. As for their ages and breeds: Chibi-chan is a senior gentleman and a mix of toy breeds, Penelope a ~3 year old rat terrier, GingerPeach and Rocky are ~10-11 year old Golden Retrievers (perhaps with a sprinkling of Lab), Geronimo an 11.5 year old herding breed mix of Australian Cattle Dog and perhaps Kelpie, and Piglet is an 11.5 year old Carolina Dog, aka an American Dingo. I enjoy the Posse’s variety of sizes, breeds and breed groups. NOTE: while I recognize a dog’s size, age, breed, and breed group, I do not limit, label, stereotype or otherwise restrict him by this information. Instead, I see, interact with, and enjoy each dog for the unique individual he is. Each of the Posse dogs was found homeless, abandoned and in a state of neglect – physical, emotional and intellectual neglect. I mention that history for educational purposes. I’ve met people who assumed, based on my profession, that I would only have dogs I have screened, “hand picked”, and purchased from breeders. Not so. Each of my dogs and I met serendipitously! In addition, I was not at all looking to add a dog to my life when our paths crossed! However, they each needed a family and I had room in mine (and also in my heart) and, well, that was that. I mention it because I’ve met people under the impression that rescue dogs and/or mixed breeds are “lesser than” overall and in their ability to learn and perform. Not so. If a dog isn’t learning or performing, we look to and fault the training method, not the dog. I mention it because I’ve met people who didn’t know rescue dogs and/or mixed breeds can enter, enjoy and succeed in dog activities and sports. There are many organizations and venues that welcome rescue dogs and/or mixed breed dogs to participate in their events. I mention it because I’ve met people under the impression that in order to build a strong bond with a dog, you must raise him from puppyhood. Not so. In the photo above, the only two raised from early puppyhood are Geronimo, (~16 weeks old) and Piglet (~8 weeks old) (Penelope was 7-8 mos old when found with her litter of pups), and yet each of my dogs and I are mighty well bonded! Healthy Lifestyle builds strong relationships. How you live with your dog is far more important for building a strong relationship, than simply how long you’ve lived with your dog. Through the years and versions, the Posse and I have experienced many behavior issues and health conditions, for example, fear of people, fear of places & things, fear of other dogs, reactivity, generalized anxiety, separation anxiety, learned helplessness, aggression and/or anxiety in response to touch (e.g., petting, grooming, paw & body handling, nail trims, Vet visits, etc), storm-phobia, resource guarding, redirected aggression, aggression toward a canine house-mate (including fights), canine epilepsy & seizures, arthritis, dysplasia, gastric dilatation volvulus (bloat), lick granumolas, recovery from pregnancy & weaning pups, heartworms, allergies, and skin & coat issues. Reminder, behavior and/or health issues are not limited to rescue dogs or mixed breed dogs, nor do all rescue dogs exhibit behavior and/or health issues. Thanks to our Life in the SMART Zone, the insecurity, instability, poor health, and negative energy are far behind us! The Plumwood Posse is now a harmonious family living happy, healthy and enriched lives. Each Posse dog is also now a confident learner, not the case when our paths first crossed. We enjoy a variety of games and activities, for example, Dog Sports (thus far, Agility, Obedience, and Rally, with Treibball and Freestyle on the horizon); using their amazing sense of Smell (“find it” games, scent work and tracking); unique Skills & Tricks involving body awareness and/or coordination and/or props; Freeshaping games, including ones where “anything goes” and I let them choose what to do with a prop or situation (which allows them to further express their creativity and cleverness); Puzzles; Impulse Control games with food, toys, people, dogs, other animals, scent, and any other items of interest; and much more. The Posse also enjoys tugging, retrieving, catching, carrying, gnawing, chewing, shredding, eating, running, pouncing, jumping, climbing, crawling, stalking, wrestling, chasing, being chased, playing with toys, laughing, digging for moles, sniffing, reading p-mail messages, leaving p-mail messages, tracking critters, rolling around on the grass, rolling in stuff we humans call stinky, scratching their backs against our fence, picking & eating apples from our apple tree (see Rocky’s apple picking skills), barking, howling, talking, singing, swimming, going on walks (rural and urban settings), hiking, romping in our yard and fields, car-rides (especially to “Grandpa’s” house), road trips & traveling, being around new people and dogs, meeting new people and dogs, supervising on projects, snuggling with me and each other, chillin’ out, stretching out, curling up, sleeping belly up, snoozing in the sun, and just all around enjoying & exploring life. 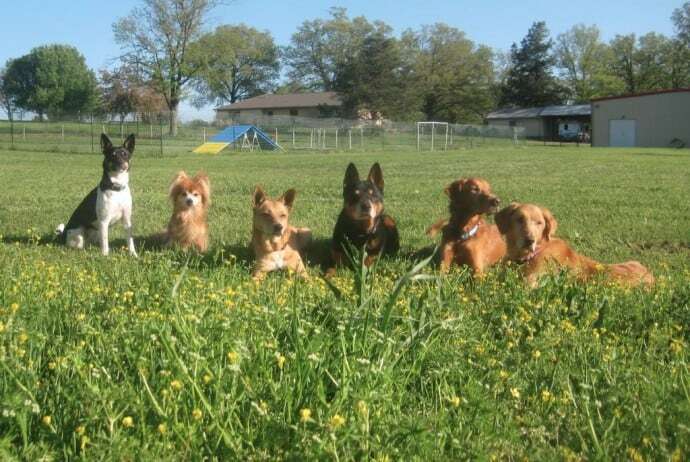 The Posse dogs have earned many Certifications and Titles, for example, AKC Canine Good Citizen, Therapy Dog, Titles (and Placements) in AKC Obedience, AKC Rally and Cyber Rally O (CRO), with additional fun goals in our future. Piglet assisted with requirements for my CAP-1 Certification, and although it is the human being assessed not the dog, her confidence and energy played a key role in my performance and resulting grade. The Posse dogs also participate in Dog Scouts of America (I am a founding member and Troop Leader of Troop 191) and are working toward their Dog Scout Titles and Specialty Badges. More cherished and valued than any role or award mentioned above, the Plumwood Posse dogs are my beloved family members, my absolute dearest friends and my best teachers. Maximizing their physical, emotional, intellectual and behavioral health remains my primary goal as we continue to learn, grow, and enjoy life together. Very beautiful Mary. I cannot thank you enough for all you do. You have my respect and friendship. Thank you, Ann, glad you enjoyed it. Likewise!